Hi guys, I thought I’d get this out before I head off for some much needed chill time/ drunken debauchery in the Big Apple … :-) … (Sorry I couldn’t help but gloat). Sadly, as is the case sometimes… even if I had been so selfishly consumed with my holiday plans as to forgo a review this week, I doubt you’d have been too disappointed. It’s fair to say this week’s iTunes single probably could have waited. 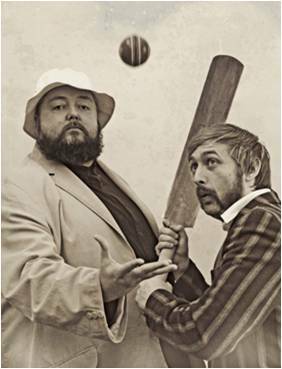 The Duckworth Lewis Method, so named for the complicated mathematical method for predicting cricket scores in rain-affected games, is also the collaborative name for Neil Hannon (Divine Comedy) and Thomas Walshe (Pugwash). As soon as I realised I’d be reviewing a single dedicated to the inglorious gentlemen’s game of cricket, thoughts of ‘I just don’t need this! !’ sprung to mind. And indeed I don’t!!! I’m down on my knees to please you all the time. You have to wonder what other sweet spot he could possibly be referring to…Hmm??? Musically, it’s far from revolutionary, and when you consider the target audience is most likely to be nostalgia-ridden middle-aged men wearing grass-stained whites; eating scones and drinking Earl Grey, I somehow doubt this is going to be one of the tracks of the summer. Doesn’t hit my sweet spot but it is sure to get a few smirks at least. Enjoy and I’ll see you when I get back!! !